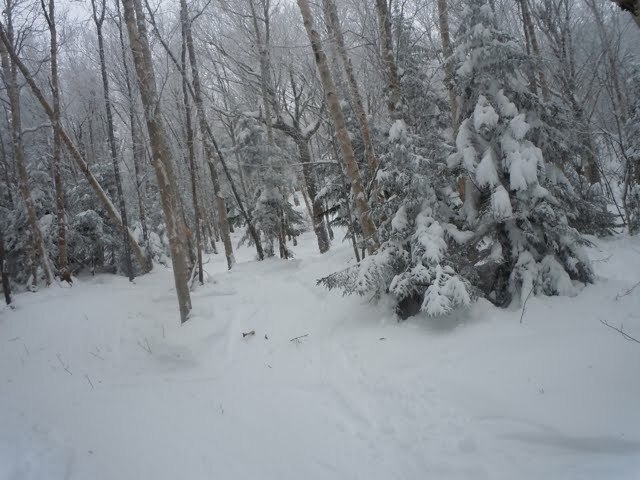 We're getting a lot of snow up here in Vermont, about 50 inches+ in a week. A record number of visitors have come to ski in the Mad River Valley too, so it was time to get off the beaten track and seek some tranquility. That means going off-piste or off the resort proper for some narrow-road and woods skiing. In general, it's really cool to be able to record the whole run on Alpine Replay and get 3D Google maps afterward. I got to the resort early and entered the off-piste area named Slide Brook Basin from the top of the North Lynx chair. The picture shows my run, a screen grab from Google Earth 3D via recording the run on Alpine Replay. My run is the blue line you can just make out by clicking on the map for a larger version, between the two developed mountains. It's great to do that and look at the map afterward. It was also a perfect escape from the crowds, very quiet and peaceful. It's a 2,000+ foot vertical run, about 3.7 miles in length, and it's all I need for a day.